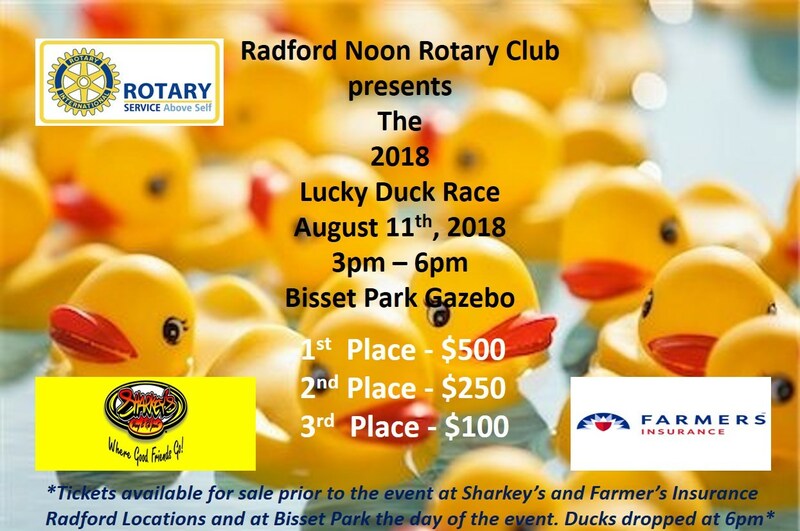 The Radford Noon Rotary Club presents the 2018 NRV Lucky Duck Race on Saturday, August 11, 2018 in the New River at Bisset Park. Are you feeling lucky? Please join the Radford Noon Rotary Club to see if your duck is lucky enough to cross the finish line first. Ducks are available prior to and the day of the event. The cost is $5.00 for one duck or $20.00 for five ducks. Ducks are available for purchase prior to the event at Sharkey's Radford and Farmer's Insurance Radford and at the Rotary tent near the gazebo at Bisset Park the day of the event. The duck drop from the bridge will occur at 6:00 pm. The ducks will fly into the river and will promptly be removed from the river immediately after the race. Proceeds from the event will help support the Noon Rotary Community Outreach Programs. The Radford Noon Rotary works each year to be able to support a number of community groups including the Radford Animal Shelter, the Women’s Resource Center, Beans and Rice and a scholarship fund which helps a Radford High student attend Radford University. Note: The event was originally scheduled to take place on Saturday, April 28, 2018, but had to be postponed due to high water. To view the event flyer, visit: https://i.imgur.com/ox5tILo.jpg. For more information on the event, visit: https://www.facebook.com/events/263867831096021/ or https://www.facebook.com/RadfordNoonRotaryClubOfficial or email radfordnoonrotaryclub@gmail.com.